Chris HEIGHINGTON (7m), Gareth ELLIS (16m), Lote TUQIRI (20m) & Chris LAWRENCE (49m). 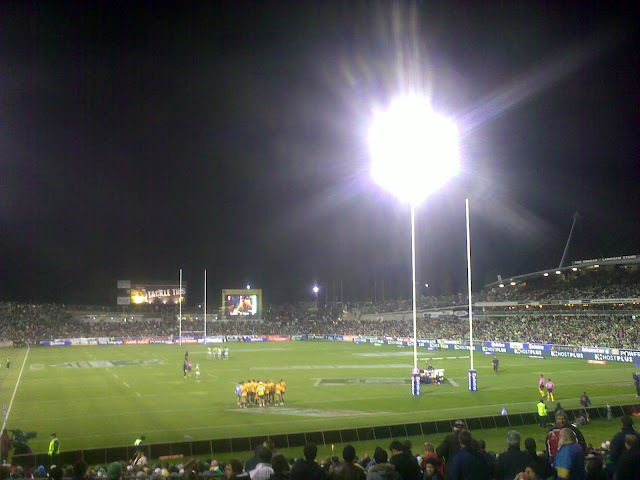 Friday September 17, 2010 @ Canberra Stadium. Crowd: 26,476. Referees: Tony ARCHER & Jared MAXWELL. the sell out crowd knew it too. Tigers move into Week Three with the victory and will face the St.George-Illawarra Dragons in a Preliminary Final at ANZ Stadium on Saturday September 25. Raiders are finished for 2010 after the loss. Despite playing at home - they have been eliminated from the Premiership race. Other Game Tweets:#NRL Before people write the Tigers off next week consider this - Robbie Farah kept his big game in the bank & Benji looked very spry. #NRL Absolutely cracking night at the footy. Crowd into it but very nervous, will be back next year for sure. Great night Canberra, head up. #NRL Good luck to the Wests Tigers. Still have another level to go to after tonight - they'll give the Dragons a huge fight. #NRL Gotta feel for Terry Campese... Stamped himself on the game then does his knee. Canberra's season ended then. #NRL Some utterly woeful refereeing... Again. Why swallow the whistle for long periods only to ruin game at key stages. Hurt both teams too. Please Note: The NRL Tweet Player of the Finals Award are provisional - this is the classic Voting System from the Regular Season - to determine the Player of the Finals their Individual Game Rating out of 10 will be heavily factored in. Full Player Ratings for Raiders v Tigers & Roosters v Panthers here. Follow the NRL Finals via The NRL Tweet.